If you are looking for a side that has a fresh zesty taste, then look no further! 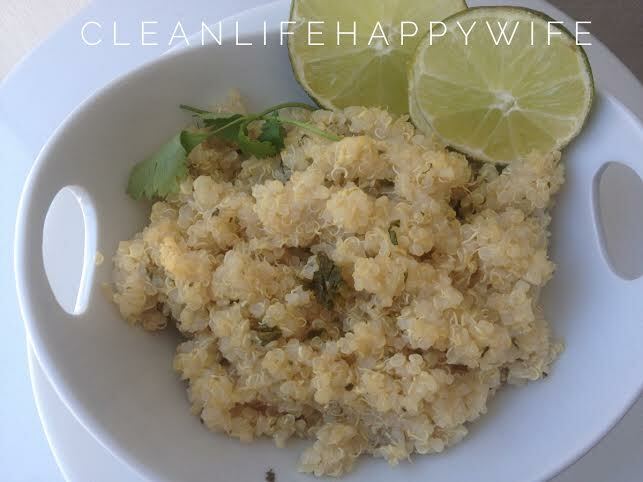 This recipe can be made with quinoa or brown rice. This recipe is super easy and only takes 3 ingredients. My kids LOVE this side! Cook quinoa (rice) according to the directions on the package. Once fully cooked, add both lime’s juice and cilantro and mix well. Sprinkle with sea salt and serve. Would you be willing to create a clean pad Thai recipe? I’m going to be starting a 60 day challenge on mon.. Like 8WC, but tweaked a little. I have a group doing it with me. I posted on our fb group about your blog as the first spot to look for recipes. Someone asked about pad thai. I love to cook but I don’t always have a ton of time to experiment. Wondering if you were say bored!?!! Lol Tamarind paste? Brown rice noodles? Oh Lynda! I love a challenge! I will look into that for sure!! We’ll see what I can come up with! !